This is a set of two AKA Racing 1/10 Buggy Closed Cell Rear Tire Inserts. AKA, the pioneer of the closed cell insert, has shrunk down the technology, and developed an insert specifically for use with 1/10 scale buggies. 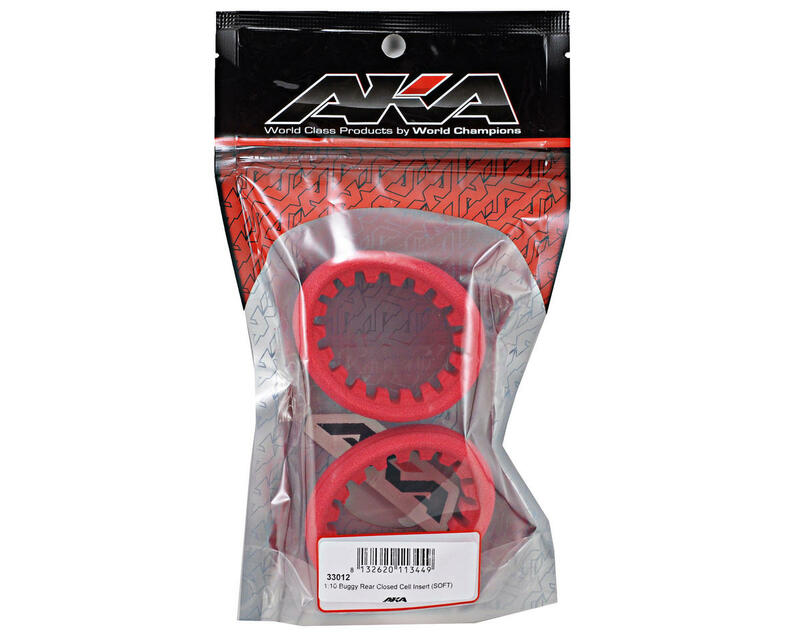 The 1/10 inserts are slightly softer than the AKA38001S Red 1/8 inserts, so they work better with the light weight 1/10 buggies, while at the same time maintaining the durability that AKA inserts are known for. These inserts were designed to decrease the lateral deflection of the tire while at the same time increasing vertical impact absorption, to provide better handling in the bumps. Using a soft foam or hollowing out the inner circumference leaves the car feeling squirmy with a less accurate feeling through the bumps, not to mention a loss of durability. Gil Losi and Mark Pavidis knew this compromise was not the solution. The solution they found was the addition of lateral grooves to the inner diameter. 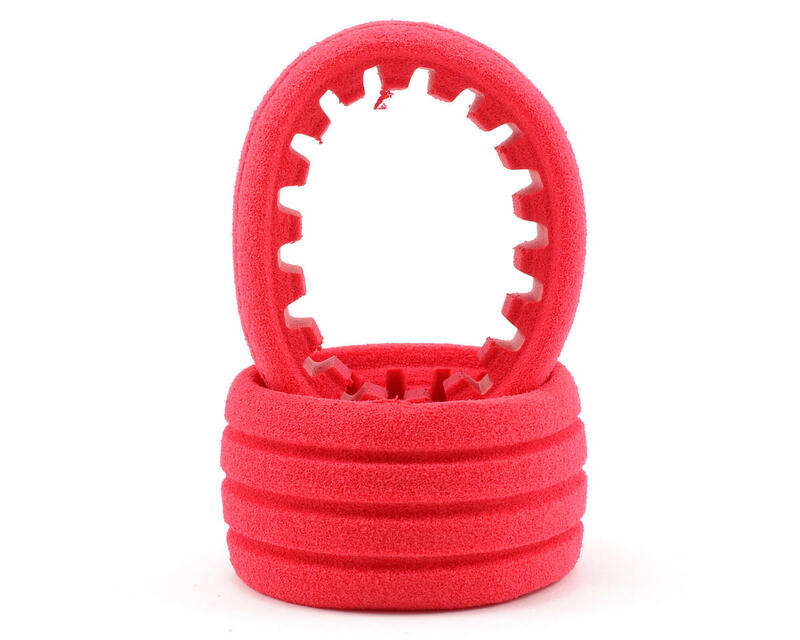 The lateral grooves allow the insert to flex vertically, absorbing large impacts while still maintaining the lateral stability and overall durability AKA inserts are known for, providing you with a no compromise, high performance foam insert. The result is a more predictable handling car, with no sacrifice in insert durability. These inserts are currently the best closed cell buggy inserts on the market. Before you mount them, work them with your hands for a good 10 or 15 minutes to accelerate the break-in process. After a couple packs around the track, they will start to feel really good. The benefit to these inserts, is that once they DO break in, they stay at a nice constant feel for a LONG time. The other guy that gave these a bad review probably glued them up with no break in, and noticed the lack of rear traction with new rear inserts. This can happen with any brand new insert as they are always firmer. Firm = lower traction. I find the proline and jconcepts closed cells to go dead FAR faster than these. I also run the AKA fronts and again, once broken in, are the best on the market. 8 customers found this review helpful. Following Brandon's advice does help quite a bit and they will break in after a while even if you don't. These are fantastic foams and clearly way better than any open cell foams I have seen. It all depends on what you like to race with I guess but I feel closed cell gives more consistency than my open cells. Used this inersts in shue minipins with good results .Outlasted 3 tires so far and no signs of wear! Great Insert! They last a long time and use them on multiple sets of tires. 5 of 9 customers found this review helpful. Best closed cell foams on the market! I won’t purchase any other foams for my race vehicles. I remove this inserts from tire.It is shrink and smaller than before. So I need to spend money for this AGAIN. 0 of 8 customers found this review helpful.